On April 12, Isuzu Philippines Corporation (IPC) together with Lazada Philippines turned over a brand-new Isuzu D-Max as the major prize for Lazada’s online promo. One lucky winner from Manaoag, Pangasinan, Mr. Rodel L. Abay, was in awe when he received his brand-new Isuzu D-Max 4x4 LS-A AT at Lazada PH’s head office in Taguig. Abay said that he couldn’t believe that he won the raffle promo; he shared that he’s aware that he’s eligible for the raffle thru his recent purchase but didn’t expect to win. 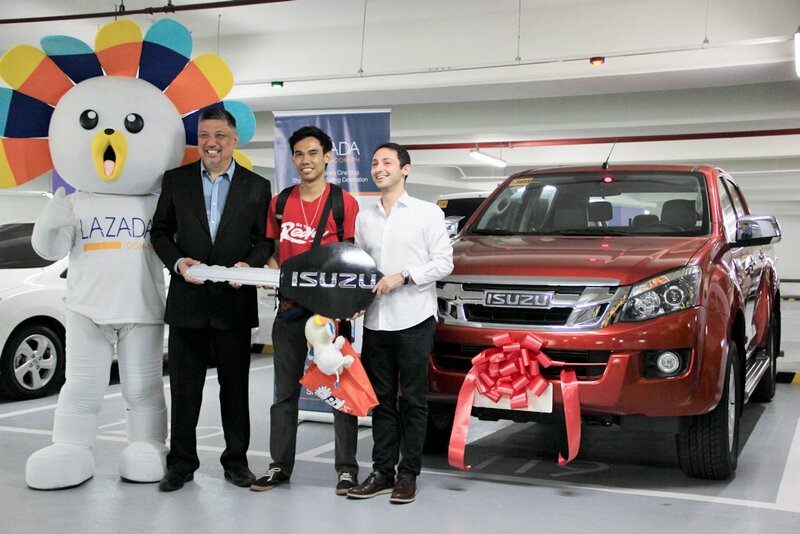 Isuzu Philippines supported Lazada’s Online Revolution promo which sought to treat its shoppers during the Christmas season. The promo ran from November 11 – December 31, 2016, and with a minimum purchase of P 2,000 shoppers can earn one (1) raffle entry to win a brand-new Isuzu vehicle. “Lazada is one of the country’s leading online store, we are happy that we have partnered with them in this promo during the holiday season. I think it is a good way to treat its customers who have been patronizing their online store. For our part, we are confident that the Isuzu D-MAX will serve as a reliable vehicle to Mr. Abay, we hope that he enjoys this post-Christmas present,” said IPC President Hajime Koso. Powered by Isuzu’s 4JJ1-TC (HI) diesel engine, the Isuzu D-MAX 4x4 3.0L LS-A AT produces 163PS at 3,200rpm and 380Nm of torque. Equipped with common rail direct injection, intercooler and Variable Geometry System (VGS) turbocharger, the D-MAX to provides ample power even on the toughest terrain. The Isuzu D-MAX also boasts top of the line features like the projector-type multi-reflector headlamps with LED daytime running lamps, chrome power-folding side mirrors, leather seats, and a 7-inch touchscreen display entertainment system capable of Bluetooth and iPod connect among its various multimedia connectivity.